There's the traditional flute, horn, reed and string voices as found on many organs, or approximations of them is probably a more accurate description. A synthetic string ensemble (yellow button). Harmonic couplers (blue buttons) which couple each key on the upper-manual to another one a bit higher up, with three different options as to how far up the manual the additional notes will be. Synthetic orchestral instruments (orange buttons) for either the upper- or lower- manuals, though it's more synthesiser–sounding than intrument–sounding. 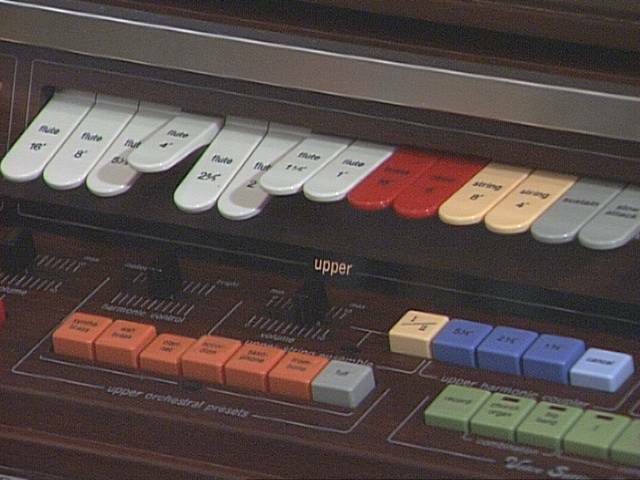 And the start of the registration memories (green buttons), with two factory presets (“church organ” and a synthetic “big band” instrumental sound) and four user-programmable memories (stores and recalls all of the button and switch settings above the manuals, the other controls on the console are ignored).